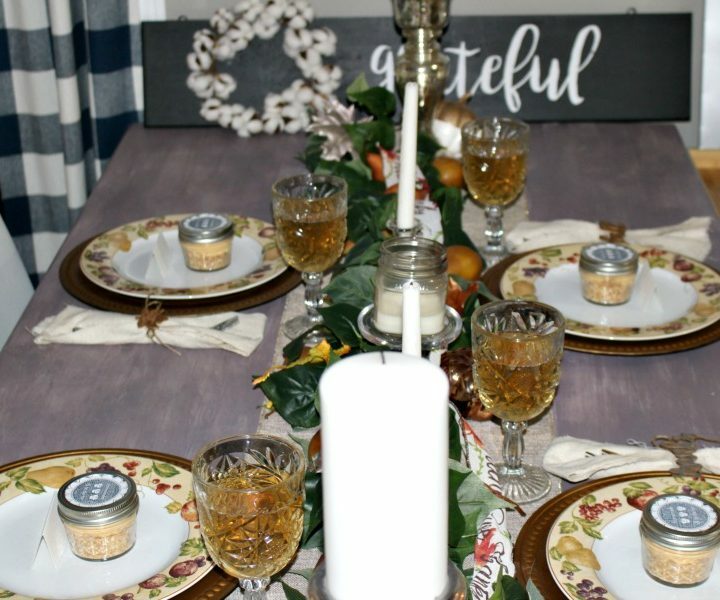 Today I am sharing a simple Thanksgiving tablescape along with a yummy mini pumpkin cream pie recipe, that is one of my family’s favorite fall desserts. What makes this recipe even better is it is served in a mini mason jar. Because we all know everything is better in a mason jar, right?! This year we are spending Thanksgiving at my sister’s house, which I am so thankful for. She knows I love to set a pretty table, so while she is focusing on the cooking, I will be setting the table. As I need to transport the decorating essentials I can’t pack up the fancy china. Luckily, I once again found beautiful autumn dishes at the Thrift Store for a dollar a piece! At least if a dish breaks along the way, I won’t have to worry about it being a cherished family heirloom! The Dollar Store was just unpacking their Christmas decor and these gold chargers were fresh out of the box. I scooped those up right away, as they will be great for Christmas too! As the tablescape needed to be simple, I used a burlap runner that has gold detail and it is perfect to go with the autumnal theme. Next up, an ivy garland that I previously used in a Summer Lemon Tablescape. Garlands are great to decorate with, as they run the length of the table but they don’t obstruct the view of the dinner guests. There is nothing worse than trying to talk over dinner with a huge floral arrangement in front of your face-though they are beautiful! I simply laid the garland along the length of the table and added the gold pears mixed throughout. It is always nice to have candles, so my mercury glass candle holders anchor each end of the table, along with taper candle holders to even it out. Next up, run a Thanksgiving themed ribbon through the garland for an extra pop of color. This ribbon was left over from the fall tablescape I shared last month. 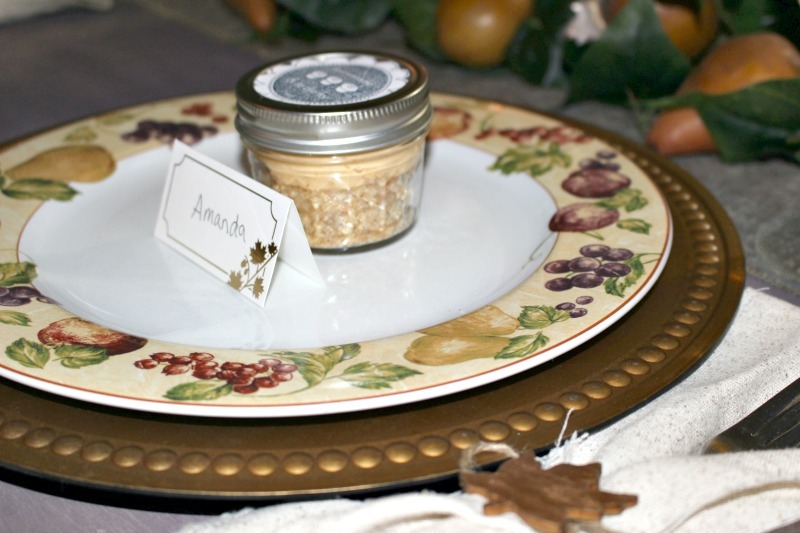 Add a place card and mini mason jar desserts and each place setting is complete! Now for the yummy pumpkin cream pie recipe! Mini Pots Of Pumpkin Cream Pie – The Crafting Chicks. My family absolutely loved this dessert and every year they ask if I will make it. It is quick and easy, plus it is also good when you don’t want a full slice of pie after eating a huge Thanksgiving dinner! 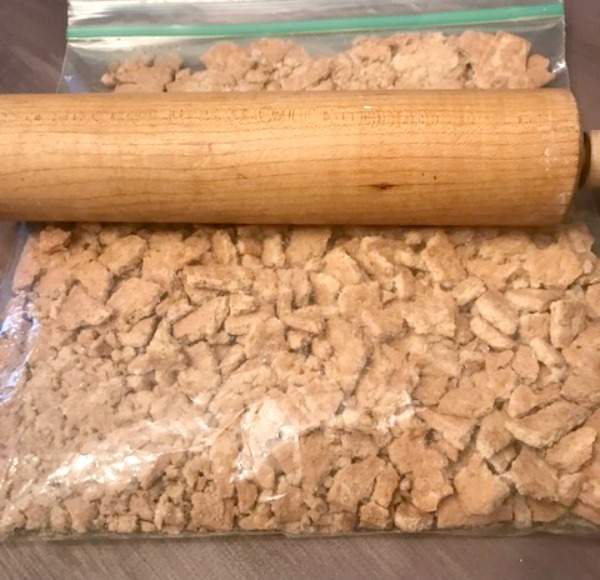 I don’t have a food processor, so I always use a good old fashioned rolling pin to crush the graham crackers. Add the sugar and butter (see the full printable recipe below) and mix well. Press into the mini mason jars using the back of a spoon, or your fingers. Add the pumpkin cream mixture to each mason jar and top with whipped cream. You can add a dash of cinnamon if you like. Be sure to refrigerate about 3 hours prior to serving. For the top of the lid I added a label that I stamped with “homemade & to die for”. It fit perfectly on the lid! Too cute right? I would love to hear if you give this recipe a try. Thank you so much for stopping by and I wish you all a very Happy Thanksgiving! Individual mini pumpkin cream pie recipe that is quick and easy to make, but so good! 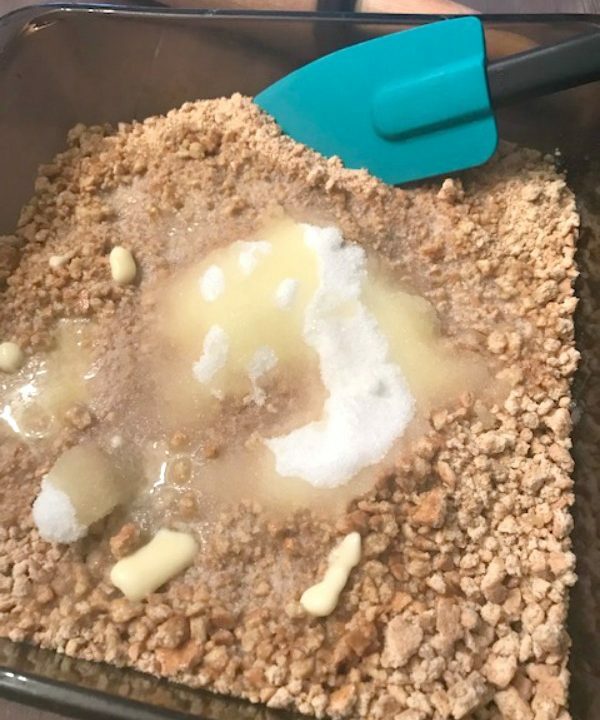 Mix graham cracker crust ingredients together. Press into the mini mason jars with your fingers. Chill. Mix together all filling ingredients in a bowl by hand or on low speed with a blender for 1 minute. 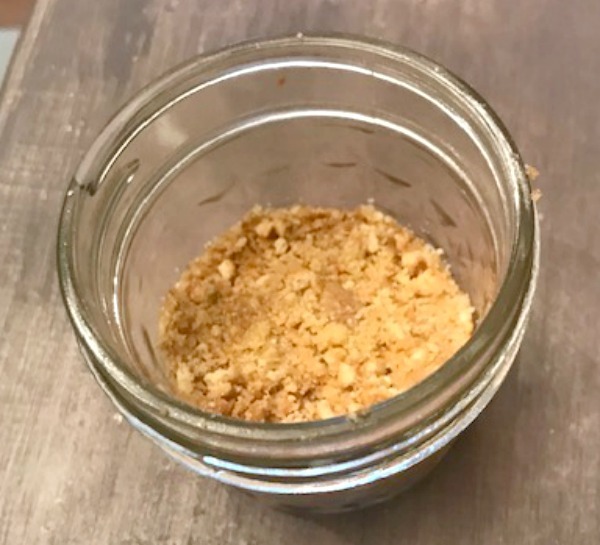 Spoon filling into mason jars on top of the graham cracker crust. Top with a layer of whipped topping and a dash of cinnamon. Chill in the fridge for about 3 hours. 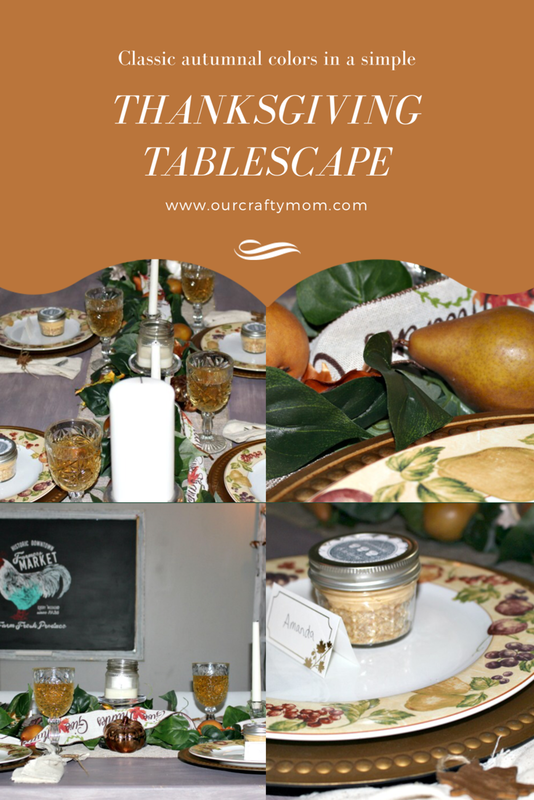 Be sure to stop by and visit all the talented bloggers who are sharing their Thanksgiving Tablescapes with us. This is one of my favorite blog hops and I seriously look forward to being wowed by these ladies each time. You will know exactly what I mean when you see the beautiful decorating inspiration. 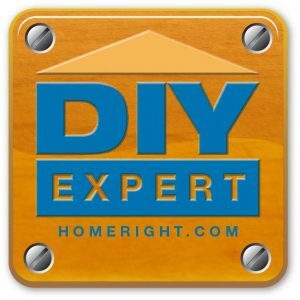 A huge thank you to my friend, Chloe from Celebrate And Decorate for hosting this fun blog hop. What a great deal on those beautiful plates! They are the perfect dishes to set the scene for your Thanksgiving table. I love how you added the golden pears and ribbon to your centerpiece! I am thankful that we have connected and got to meet this past year! God bless you and your family this Thanksgiving! Did you know your popup box with request to share comes right over your comment box? 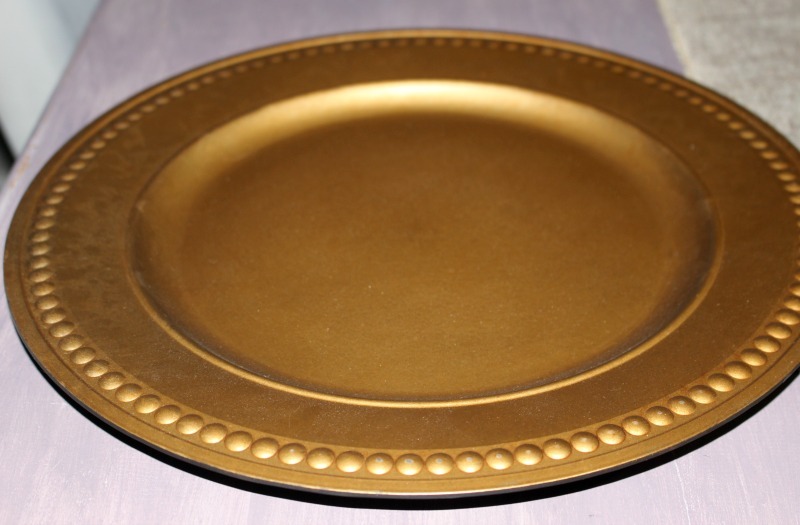 Aren’t you smart to find those pretty plates at the thrift store! 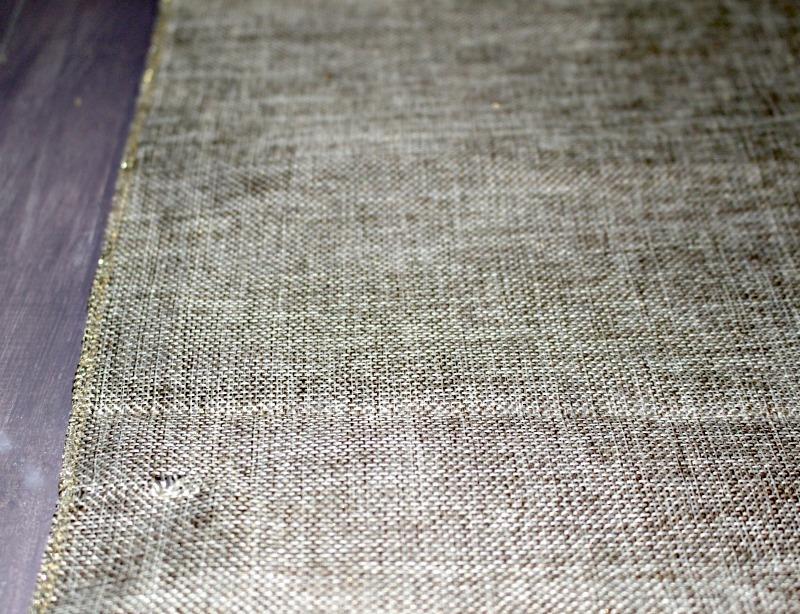 And golden pears are the perfect touch for your garland runner! How much fun to share the Thanksgiving tasks of cooking and decorating with your sister. 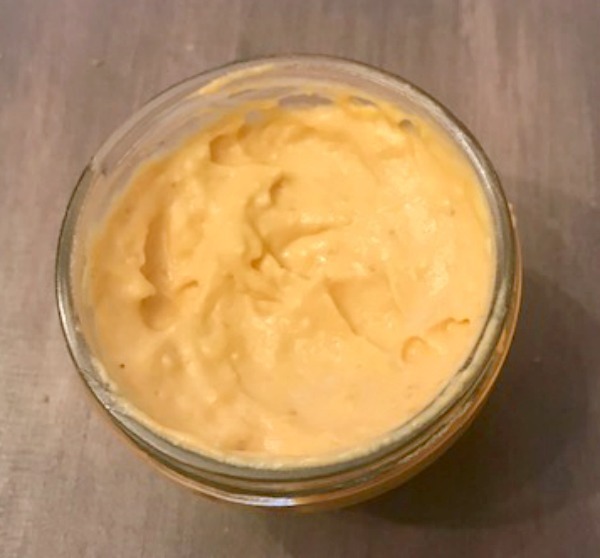 The pumpkin pies in a jar are so smart, easy to serve, easy to eat and easy to make, Win Win Win! Have a wonderful Thanksgiving Michelle! You have a wonderful example of how you don’t have to spend a lot of money to set a pretty table. The golden pears were the perfect pairing ( no pun intended! )for your new plates. Your pumpkin pie jars are a wonderful idea for those who want to take dessert with them and enjoy it later. Have a wonderful Thanksgiving! I love the joint effort between you and your sister. Working together gives you more time to relax, enjoy your family and your delicious Mini Pumpkin Pies. Beautiful table and great deal on the plates. Happy Thanksgiving and it’s a pleasure to hop with you again. Michelle, what a bargain on those pretty plates! I agree with Rita, they would be a nice hostess gift for your sister. The golden pears are perfect with your dishes. 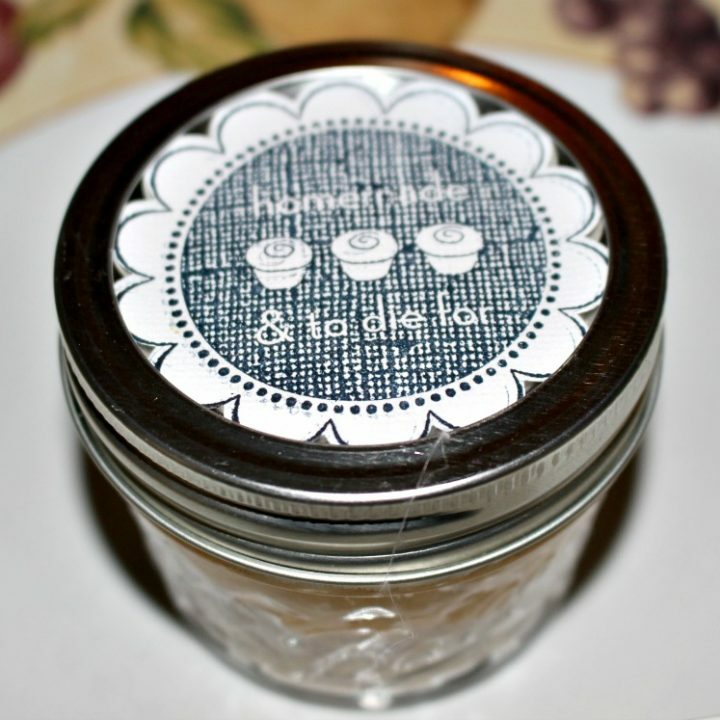 What a wonderful idea after you are stuffed from the meal, you can take the pumpkin pie in a jar home to enjoy later. Happy Thanksgiving! Michelle your table is so pretty. Pears are one of my most favorite fruits and the golden pears you selected match your bargain dinner plates perfectly. Almost like you painted the plates to match. The positioning of your candles and different sizes compliment your tablescape. 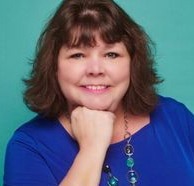 Don’t ya just love these blog hops for inspirational ideas? Thanks for being a part of this team of exceptional bloggers. 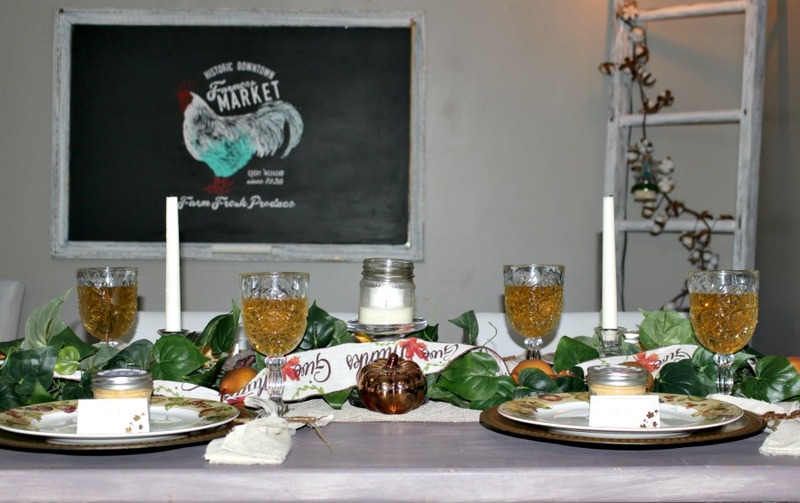 Kari @ Me and My Captain recently posted…Talking Turkey Thanksgiving Tablescape! The plates are so pretty and better yet, a bargain. The added golden pears truly make this a lovely Thanksgiving table. I love a thrifted table. So many wonderful bargains out there. the little dessert jars are fun. 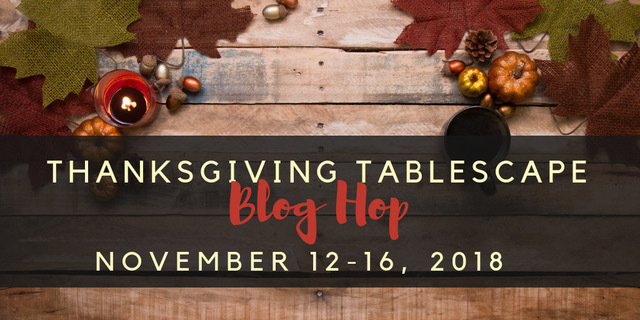 A pleasure joining you on this Thanksgiving table blog hop. Have a wonderful Thanksgiving. Those chargers and plates were a great find! I’m so jealous our dollar store doesn’t get good dishes and I’ve never seen chargers before but I will be looking more closely now. Have a great Thanksgiving at your sister’s. What pretty plates and a bargain too Michelle! Your mini pies are adorable, anything in a mason jar tastes better! Happy Thanksgiving! Michelle, using the Dollar Store plates for transporting was such a smart idea. They are really pretty. And thanks for the pumpkin recipe. It’s always good to have plenty of those ready for the holidays. Michelle, all I can say is yum! Those mini pumpkin treats in jars is adorable, and such a thoughtful table favor. Thanks for the handy tutorial too! Like you, I am heading to one of my sisters’ for the holiday. As much as I love to host Thanksgiving, it’s also fun to be a guest. Mostly, it affords a way for our adult children, who are scattered from coast to coast, to all come together. Happy holiday to you! Hey Michelle! 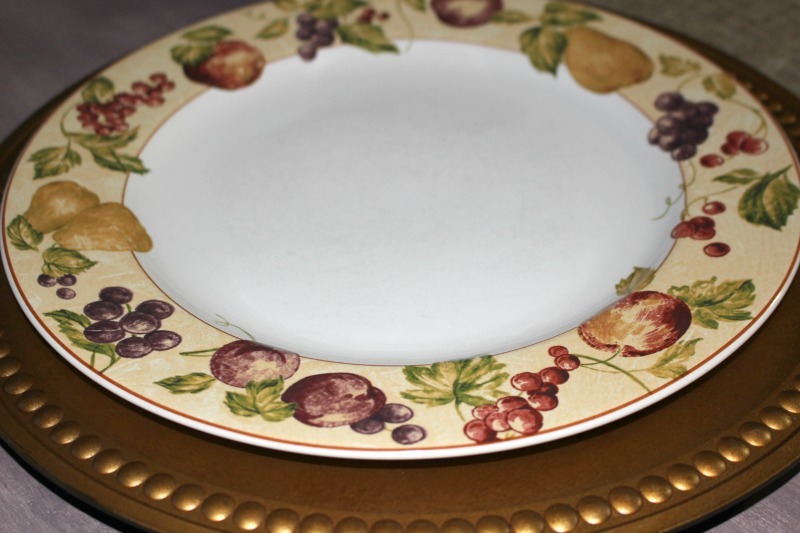 I love your tablescape with your gorgeous charger and plates you found! 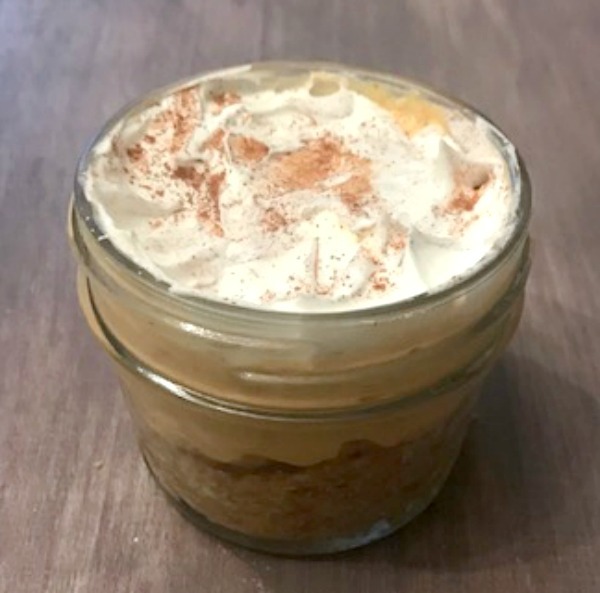 The Mason jar desserts are a show-stopper – thanks so much for sharing the recipe with us! So happy to be hopping with you! Oh my gosh – those pumpkin cream pies sound so good! Love your place settings too. 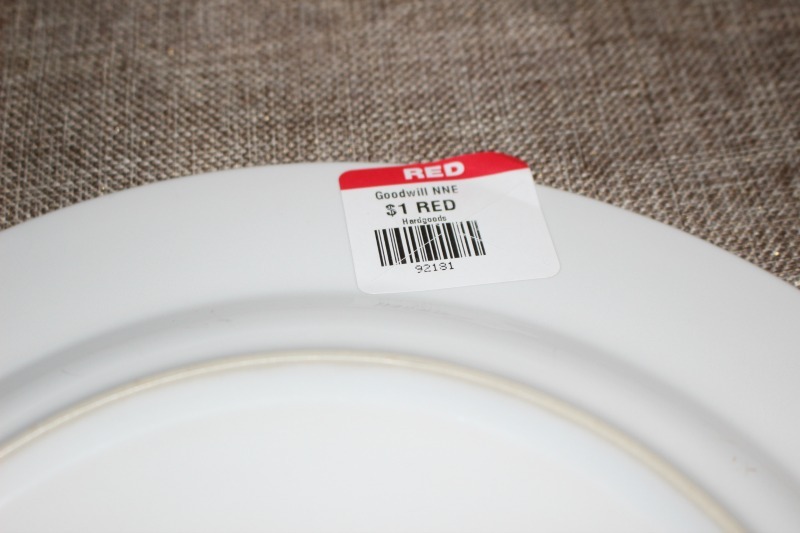 Great idea to find thrift store finds so you don’t have to worry about plates breaking in transit. Hope you have a wonderful time at your sister’s! Hi Michelle! Those plates were a great find and perfect for the season. 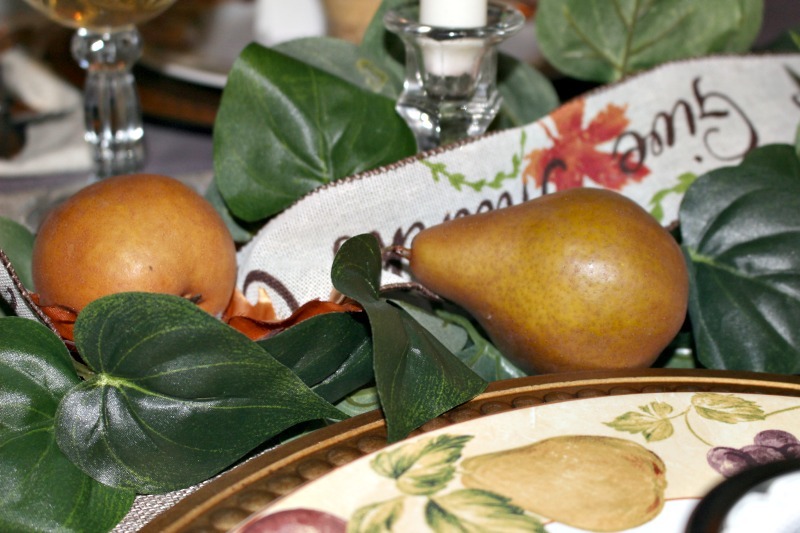 I love the inclusion of pears – I’m a pear lover this year – and the autumn colors and accents that are woven throughout your table setting. And those mini pumpkin desserts? YUM! I hope you and your family have a wonderful Thanksgiving! Hi Michelle! Those gold chargers were a great find. You’ll definitely use them at Christmas and for many years to come. 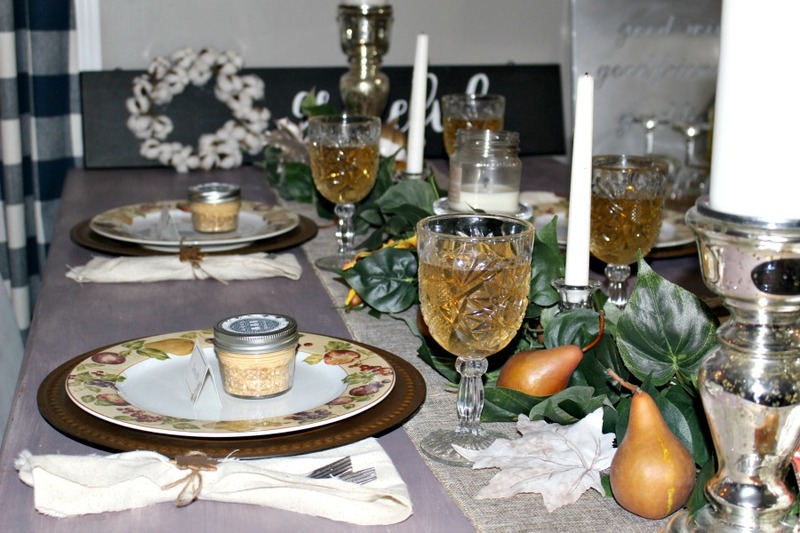 I love how your pears in the centerpiece match the pears on the thrift store plates. But my favorite part is the individual pumpkin cream pies at each place setting. Very original! Thanks for sharing the recipe. I hope you have a wonderful Thanksgiving at your sister’s home.